So what, then, of the right to privacy? Foolish people who cannot or will not read above a 3rd grade level might spout the overused nonsense about how there is no such right in the Constitution. Anyone who can or will read above a 3rd grade level will already be aware that the 9th Amendment makes it absolutely clear and explicit that rights do not have to be mentioned in the Constitution in order to exist. THAT the right to privacy exists is a well-established fact of law, regardless of how monstrously that right is abused in everyday life, often in the name of the law. So when Anonymous – cowering behind their shroud of anonymity – tramples over that right, regardless that the people so trampled were “bad,” how are thinking people supposed to react? Are we to imagine that members of Anonymous are shielding themselves from the consequences of a law that is unjust? Yet how can a right – that is held by ALL PERSONS, regardless of whether we like them or not – be unjust when it is, in point of fact, the very paradigm of a just law? Recall here as well that the KKK themselves traditionally embraced anonymity in the face of laws they believed were unjust, in the name of a higher “justice” which they declared themselves to be serving. It is easy to see that the KKK was wrong, as the “justice” they fancied themselves to be serving was, in demonstrable reality, the very model of an unjust law, a law that degraded human personhood, that imposed a rule on others which those others had no voice in forming, and so on. But are we seriously to believe that in this, or any other situation, two wrongs magically make a right, even when Anonymous is the author of at least one of those wrongs? Which brings us to the whole “anonymous” thing. Is it even possible to fight for justice while sniveling in the shadows? There does not seem to be an abundance of evidence that Anonymous abides by this standard of justice. Nowhere in the actions Anonymous has taken do I see either the openness or the lovingness that King set out as the sine qua non of a justifiable defiance of the law. Indeed, by their very nature, Anonymous operates in a framework that expresses the deepest contempt for law. There is no accountability or control over their actions of any kind – why is that OK when they do it, but not OK when somebody else does it? Oh! I forgot! They’re on “our side,” so what ever they do is, by definition, “OK.” So why is it, when others apply that same standard to THEIR actions and heroes, we are outraged by the injustice of it? I agree with your position here. There are a couple of points it would be interesting to see addressed…Or perhaps they have been addressed and I haven’t quite followed. 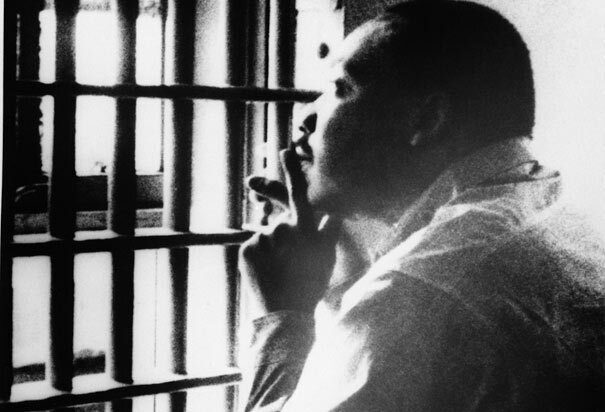 For example, fighting for justice anonymously does not always equate to “sniveling in the shadows.” With all due deference to Dr. King, it simply is not true that “One who breaks an unjust law must do it openly.” It did not apply, for example, to the Southerners and Northerners running the Underground Railroad. It does not seem to be an argumentum ad Nazium to say that it also did not apply to German citizens hiding Jews from the Nazis. Those who fight for justice fight in various ways. Some may have to remain anonymous lest they or those they are protecting end up not only in jail, but dead. I can see that there is a difference in kind here between these instances and the case of Anonymous, but I lack the background to put it into philosophical terms. As you note, Anonymous’s actions cannot be defended on the grounds that they are outing members of a group that would degrade personhood; the reason is that Anonymous has set itself up as the arbiter of that question and is responsible to no one for its decision: “What Anonymous is doing is wrong; it is subject to no legal, logical, moral, or democratic controls of any kind.” If Anonymous were not anonymous, would its actions be defensible? What controls would it be subject to? Moral outrage? But where is the moral outrage now? It rests to people like you to point out the indefensibility of Anonymous’s actions. Who or what is the rightful arbiter when it comes to unjust laws, those that degrade personhood? As King showed, it is not always the government, which often lags behind on issues of fairness and justice. As you note, the KKK believed themselves to be fighting against unjust laws, whereas you and I see them as a group that would (and often did) deny equal rights and liberty—therefore degrading personhood and (depending upon the timeframe) fighting against JUST laws. Many evangelical Christians believe that gay marriage degrades personhood; you and I see that belief itself as degrading personhood. Since I’m not a philosopher, this may be sloppy rambling, but I found this post very interesting and am genuinely interested in these questions. good points Gary. I volunteer at an org whose mission is to inspire people to love nature. recently the org heads decided we should tell visitors to our site about global warming. we received training in how best to influence visitors to support policy change about fossil fuels. I happen to also want policy change about fossil fuels but I feel funny using my volunteer uniform as a tool to influence the public on a polarized issue. its like evangelism.. i dont like when its done to me so… Like Gary I am concerned when asked to use questionable methods for “good”. In this instance, as you are presenting your person to the public — in “uniform,” but not really hiding behind it — as long as the information is scientifically sound, it strikes me as less problematic. And while consensus itself is never enough, the 97%+ consensus in conjunction with the enormous and varied lines of evidence (“data density” I call it in an earlier post) the only polarization on the issue is that which is fabricated by ideologues in defiance of the facts. This does not undermine my argument; quite the contrary, it makes it stronger since it highlights the disregard for rights, and the lack of transparency in the people doing the outing. Word is that the “real” list will be released in a few more days. When it is released, that list will enjoy the same level of credibility and moral responsibility as the fraudulent one.